In downtown historic Durango, Maria’s Bookshop has been fostering community relationships since 1984. As a member of the American Booksellers Association, Maria’s is welcome to all readers, both young and old. Whether you’re browsing for a good read or shopping for a unique gift, we offer journals, calendars and educational children’s toys. Our knowledgeable staff also double as a team of avid book-readers and we are more than happy to provide suggestions. Our passion is giving support and appreciation to the community through our shared love for books. 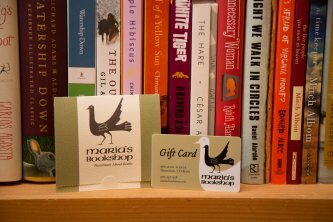 Maria’s Bookshop is Durango’s elegant book emporium located on Main Avenue. For over 30 years, Maria’s has received overwhelming love and devotion from its patrons, and we pride ourselves on being built around the wants and needs of our local citizens. 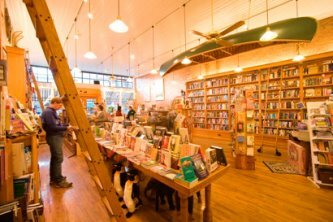 As a world-renowned bookshop, our goal has always been to encourage and uplift other locally-owned independent businesses. 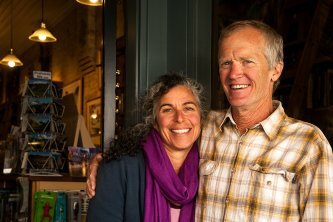 Owners Peter Shertz and Andrea Vantaggio are proud to serve the area for nearly 20 years and have laid deep roots here in the Durango area through supporting local causes, charities and vendors. At Maria’s Bookshop, we are committed to “green business” practices to inspire Durango’s inhabitants to be environmentally conscious. Step into the nostalgia of our 100-year beloved building in downtown Durango, where you’ll find our custom-built wooden shelves filled with over 40,000 culturally enriching books to explore. Our texts are chosen specifically to pay homage to our local history and Southwestern roots here in Colorado. Our original brick walls and authentic decorative space offer a warm atmosphere to read and reflect with the whole family. Join us for weekly events, discussions and book signings by local authors! Photos courtesy of Scott D W Smith / Imagesmith Photo.